My job is storytelling – peoples’ stories, corporate histories, stories of big needs and big challenges, personal moments, things learned and passed on. I’ve done a story that shares the lore of a lakeside cabin, one about an adult child’s devotion to mom’s cooking, and a salute to a family’s golden retriever that was part kid, part nanny and part saint. Nearly three years ago, I started up a conversation with with Denim and Steel’s Todd Sieling and Tylor Sherman, and product designer Kaishin Chu about the possibilities for digital storytelling. We didn’t have an unconference in mind, but it surfaced pretty quickly. The four of us got seriously excited. 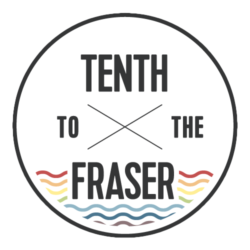 It seemed like the natural extension of Todd and Tylor’s concept for a forum where people with tech and non-tech creative skills could come together. No insistence on outcomes, just a keen interest in what this kind of enriched chemistry might produce. So, an unconference? I didn’t have the vaguest idea what that entailed. I had worked on conventional conferences before, and the stress those events produce didn’t carry much appeal. To get me started, the concept was outlined and I was given links to explore. I did my reading but remained pretty skeptical. I could appreciate the immediacy and power of the self-organizing, creative ideal, but figured it could just as easily devolve into a free-for-all, unfocused mess. But, my three comrades were eloquent and compelling, so I braved it out. July 10, 2012, the day of the first Digital Storytelling Unconference. Fifty-plus people arriving at the New Westminster Network Hub (At the River Market on Westminster Quay – the view alone is worth the visit). Lots of friendly milling. People moving together and then apart and then together again, many times. On cue we collect in the Network Hub’s main meeting space. After a quick welcome, and quicker explanation of a few ground rules, we launch. Thirty-second pitch slam not what I expect at all. It stokes the group energy. My turn. I stand up, speed through my session pitch (all about what I call life mapping, in just under 30 seconds, I reckon) and I sit down. Then the self-selection part that I am the most curious, and the most skeptical, about. We swarm the bulletin board to mull the pitch options written on Post-it Notes. Only a couple of moments of seeming confusion while choices are recorded, then a return to seats. The day is set. I’ve never seen a menu of possibilities so quickly parsed into a working schedule. I decide to surrender my cynicism to the day. I’m excited now. A pause to review and clarify then we head to first sessions. Lots of talk in hallways and quick, impromptu meetings out in the Market concourse in front of the Network Hub. From a year’s distance the energy resonance is clear, a good hum that I can still conjure – ideas still percolating. Most details are blurring now. But I remember the guy, Todd Smith of Motion Design, who sparked my interest with an idea he had about an interviewing technique he called “Breadcrumbing.” And there was the woman, seeking help for her community organization to get the success stories of kids at risk out to a wider audience. I haven’t had a day like DSU in a very long time, where I found myself so juiced. I was surrounded by strangers who shared some of my questions about how community can be made stronger through digital storytelling. DSU Vancouver 2013 can only be better. John Wellwood is the Creative Director at Echo Memoirs, an attendee and sponsor for this year’s Digital Storytelling Unconference, held at The Network Hub this coming Saturday, July 13 from 9:30am to 5:30pm. Your $25 (+ fees) ticket registers you for the event, plus gets you lunch and refreshments for the day. You can find them on Twitter @DSUVancouver or check out their website at www.digitalstorytellingunconference.org for more info. Freelancer Unconference This Saturday + Ticket Giveaway! There are lots of freebies to be received (moo cards! ), and lunch (from Re-Up BBQ, Fathom, Pamola or Wally Burger) is included in your ticket price of just $15. Seriously – $15. That is an amazing deal. Note that The Network Hub will be receiving zero dollars. This year they’ve decided that 100% of the proceeds (after lunch expenses) will be going to Kiva.org. They’ll be funding small business owners in the developing world, and will have a session on Saturday so that the attendees themselves can decide which projects the funds should go to. The pool of funds can then get bigger and bigger every year, and they can keep supporting more and more entrepreneurs in the developing world to help them sustain their communities. Attendance is capped at 150 because of space constraints, so I recommend signing up ASAP. We are also super excited because The Network Hub has given us a pair of tickets to give away. To win, leave a comment and let us know what class you’d love to lead and sit in on if this was your conference. We’ll draw the winner Friday at 8AM using a random number generator. The Great Canadian Shoreline Cleanup™ is an annual event that helps keep our oceans, rivers, and lakes healthy. People from all across Canada join in to remove the human-made litter and garbage that was either dumped or accidently deposited into our water systems. 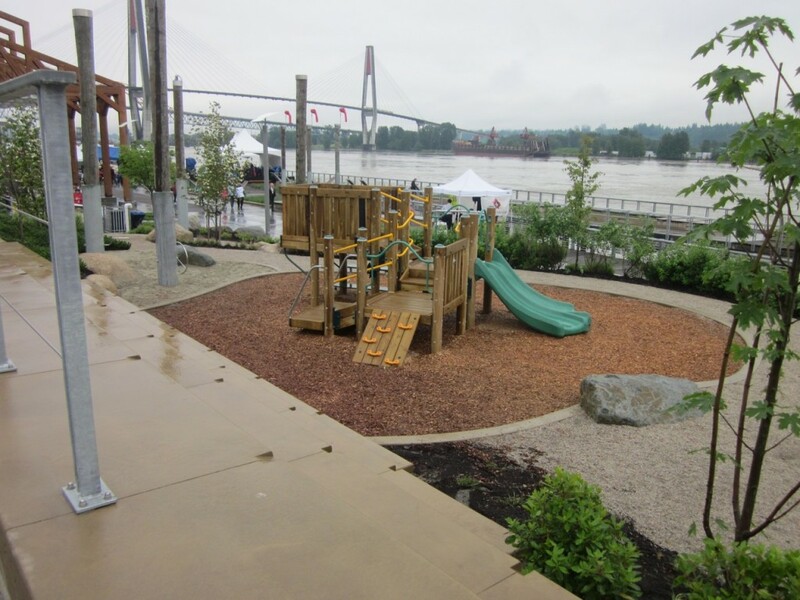 This year on Sunday, Sept 23, the South Dyke Road Riverfront Cleanup—to register, click on the link— will launch the beginning of New Westminster’s RiverFest, an art and environmental festival inspired by the Fraser River. The Cleanup is a family friendly event, open to everyone who welcomes taking care of our shoreline. And this year, participants can show their love for the shoreline in a few different ways. Throughout Canada, waste from cigarettes remains the top cleanup item collected. 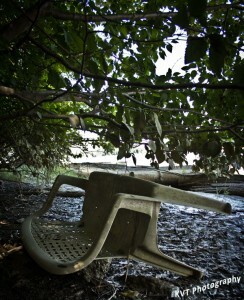 Last year approximately 350,000 were removed from our shorelines. This year—for the first time—all cigarette butts picked up from the New West cleanup will be sent to TerraCycle, a company that specializes in recycling previously non-recyclable items, such as pens, inkjet cartridges, and Tassimo coffee, tea, espresso, milk and hot chocolate T Discs. In New Westminster, Nestlé candy wrappers and empty containers from Garnier® personal care and beauty products can be taken directly to London Drugs. TerraCycle Canada will then recycle these items into park benches, waste bins and more! Styrofoam, another previously non-recycled item, was also one of the top items collected at last year’s cleanup. This year, with the launch of Styrofoam collection at the New Westminster Recycling Depot, other recyclable items collected during the cleanup, including Styrofoam and paint cans, will be picked up by the City Of New Westminster for recycling. Removing litter, however, is just one way that participants can show their love for our shoreline. Kids and adults can also take part in an invasive plant pull of non-toxic plants. This year participants can take part in removing holly, Lamium, morning glory, purple loosestrife, Scotch broom, and another patch of English ivy—check out the photo from last year’s plant pull. Plants are considered invasive for a few reasons. One reason is because people or animals have brought them from their original natural habitat to a different one. These non-native plants become invasive depending on their adaptability—how quickly they can grow and multiply in the new habitat. For those of us who love the taste of blackberries, it can be hard to learn that the Himalayan blackberry is considered an invasive plant (Invasive Species Council of British Columbia). 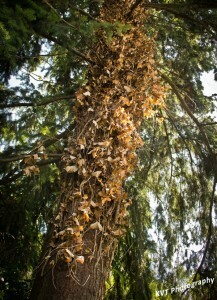 It’s dense thicket and thorny stems can be hazardous to humans and animals alike. 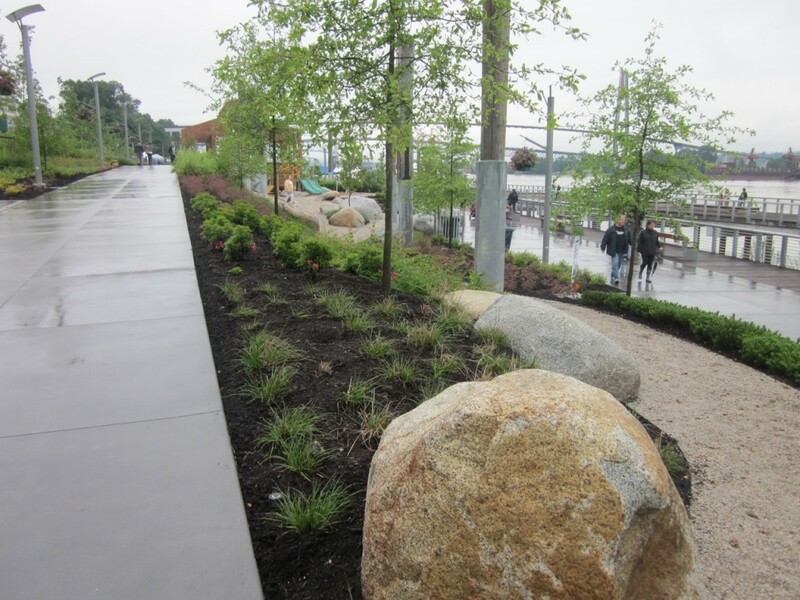 The plant can also out-compete native shrubs with deep roots that can provide stability along the shoreline. To minimize the hazard of the plant’s long shoots, Jennifer Lukianchuk, Environmental Coordinator from the City of New Westminster, and Cindy Sale, Communication and Events Coordinator from the Fraser River Discovery Centre, are going to show their love for the shoreline by putting on safety equipment to prune off some of the more exposed shoots. 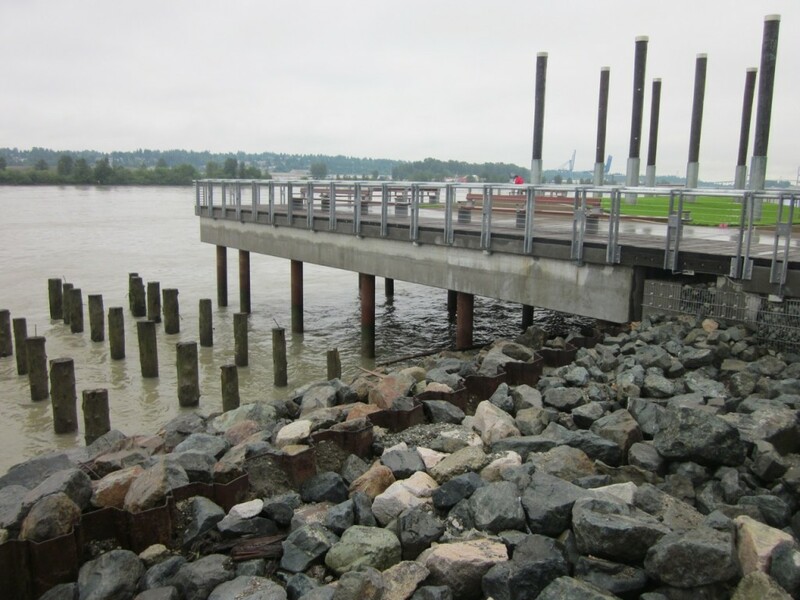 The Shoreline Cleanup starts from 9:30 AM at the pier at Suzuki Street and S Dyke Road in Queensborough, New Westminster. Participants under 19 are welcome but must attend with their parent or guardian or bring the signed waiver with them. Waivers can be printed off the website. Please bring boots that can get muddy and wear pants to protect yourself from the shrubs that grow nearby. Bring either a pen to help with data collection or tongs (some will be supplied by the City) to pick up litter, and snacks and water for yourself. 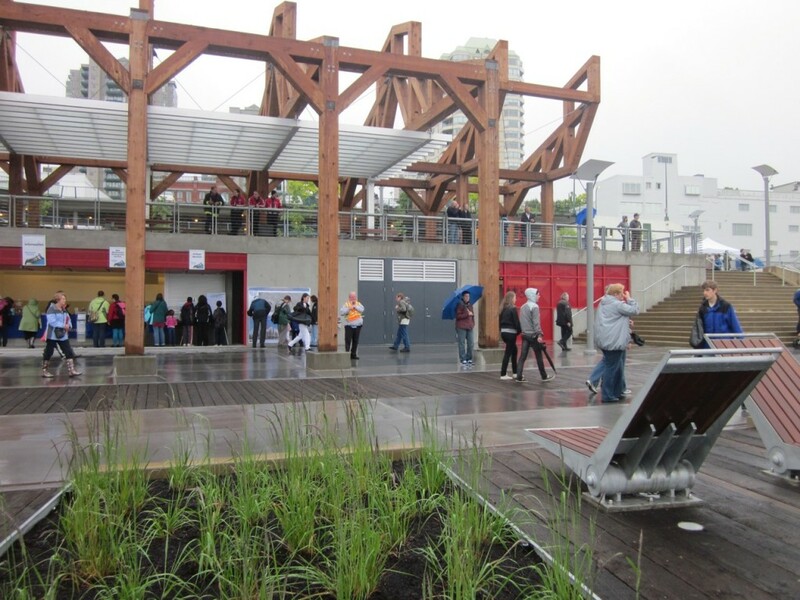 The South Dyke Road Riverfront Cleanup is organized by New Westminster Environmental Partners (NWEP) in partnership with the City of New Westminster and Fraser River Discover Centre. 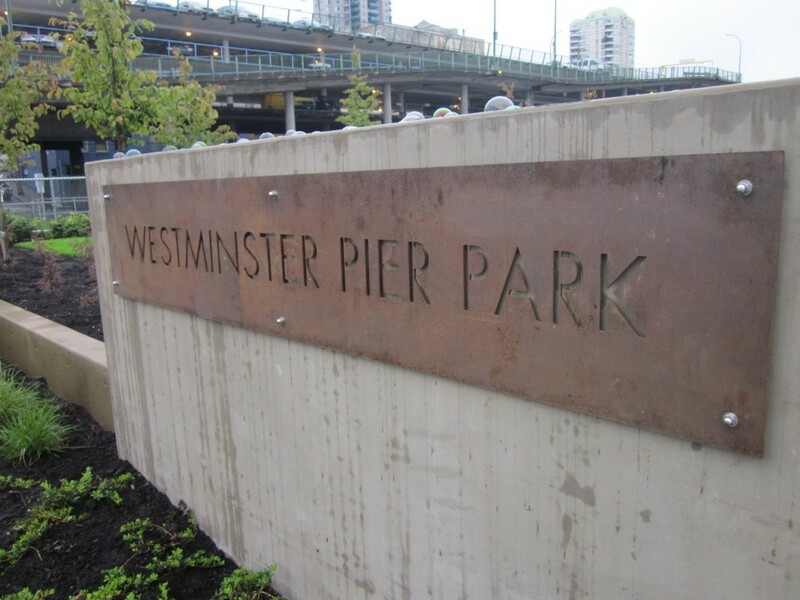 Despite the pouring rain, spirits were incredibly high at the opening of the Westminster Pier Park. 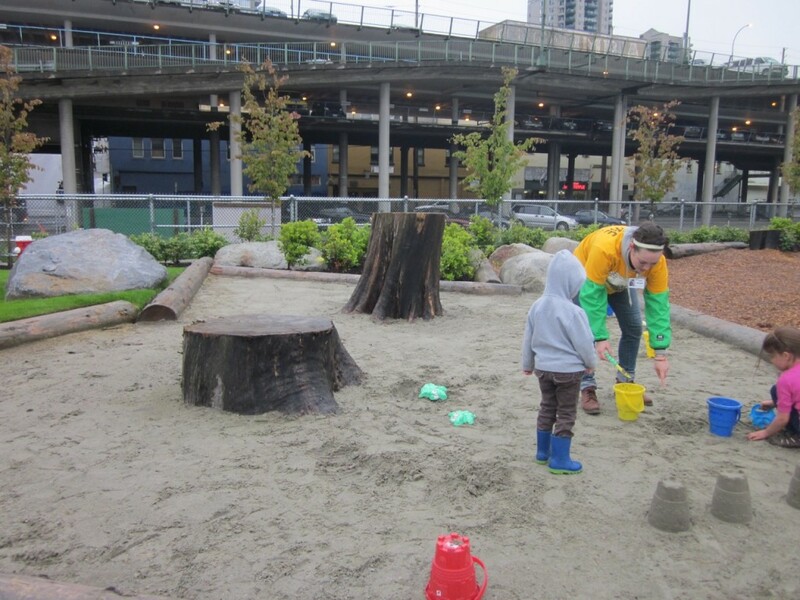 The park is beautiful – it is sweeping and interesting, and integrates places to play with spaces to relax. It is visually interesting and they’ve made smart choices with landscaping and structures. 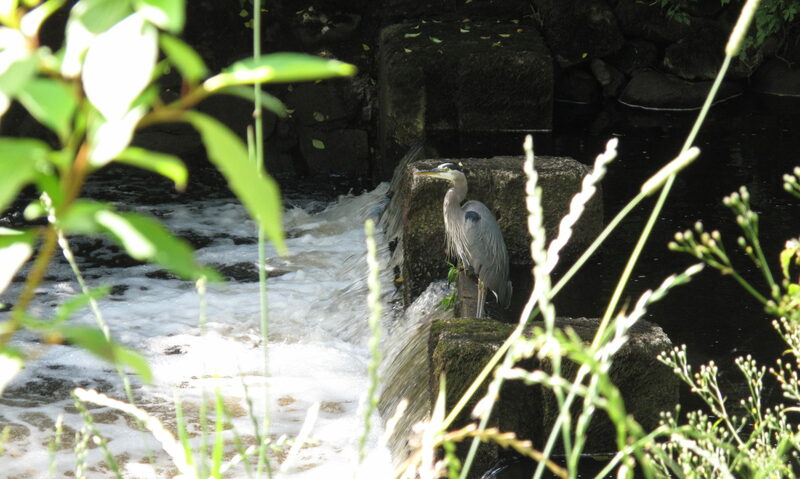 It is not all flat, either – I was expecting it to be since it is perched on the river’s edge. 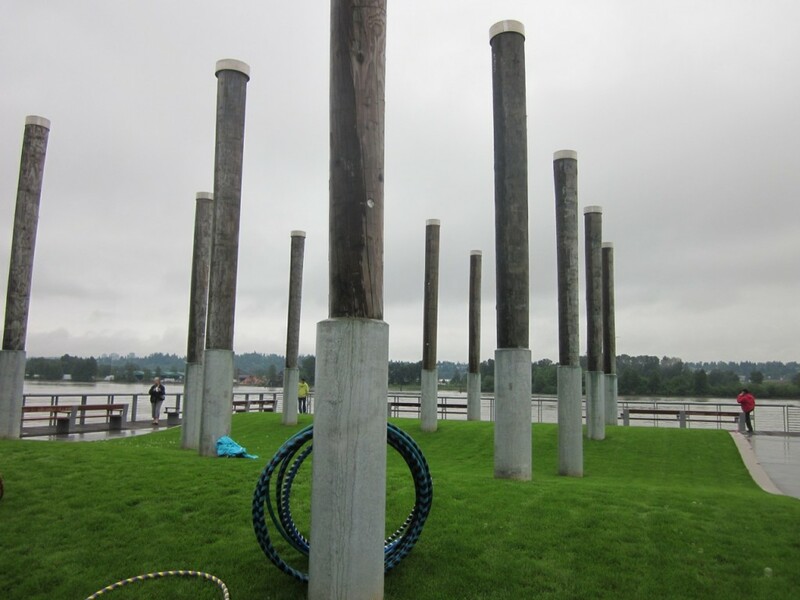 But the park design incorporates elements that remind me of the river itself, like this rolling grass area. There are a few trails that diverge and are made from different materials, which provides interest and different angles. I was kind of pleased to discover some picnic table areas along the back – each one is surrounded by plants so they felt a little private. There are a few different playground structures, and my son loved them all. They feature very interesting toys that incorporate sand play, levers, steering wheels, and lots of wood. I even kind of like the stumps – although I wasn’t sure of them at first glance. The nods to history are amazing, some subtle, some a bit more in your face. 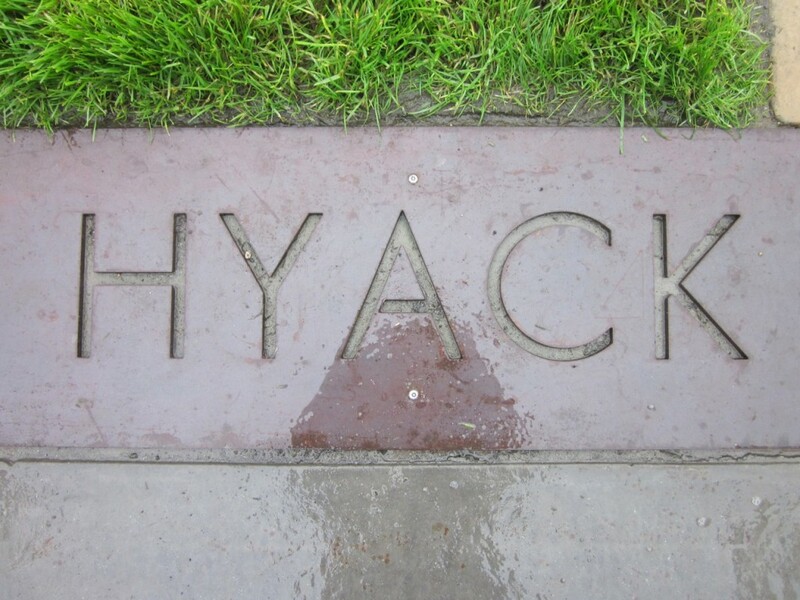 Along the boardwalk are words cut into iron plates – some are place names, some are names of special New Westminsterites, and some are just words we all know and love. The amphitheatre area is also beautiful. 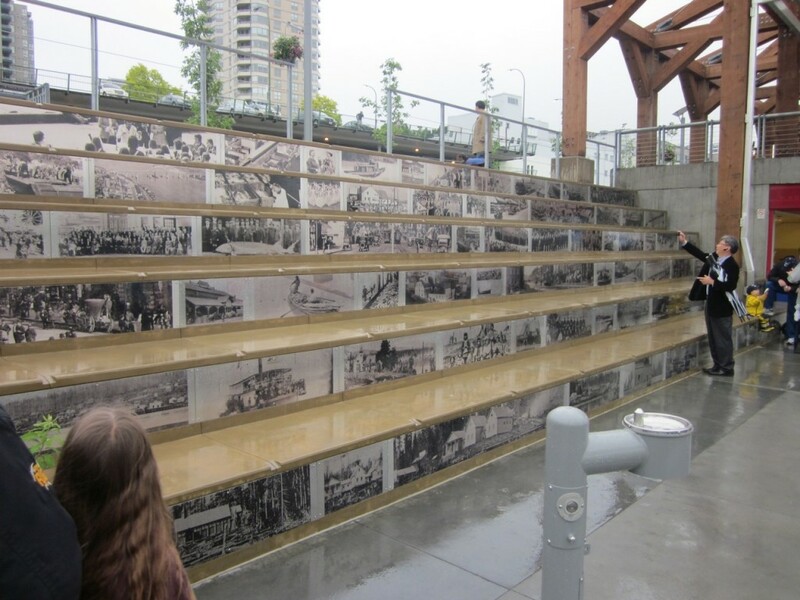 The images printed on steel flashing is really unique, and I love the pictures they chose – they aren’t all special moments – some of them are just people living and enjoying New Westminster. The building nicely integrates with the park. Despite the worry I had that the beamed structure would overpower everything, it doesn’t. It fits in nicely and provides a great central part of the park. Those reclining chairs are awesome, too. 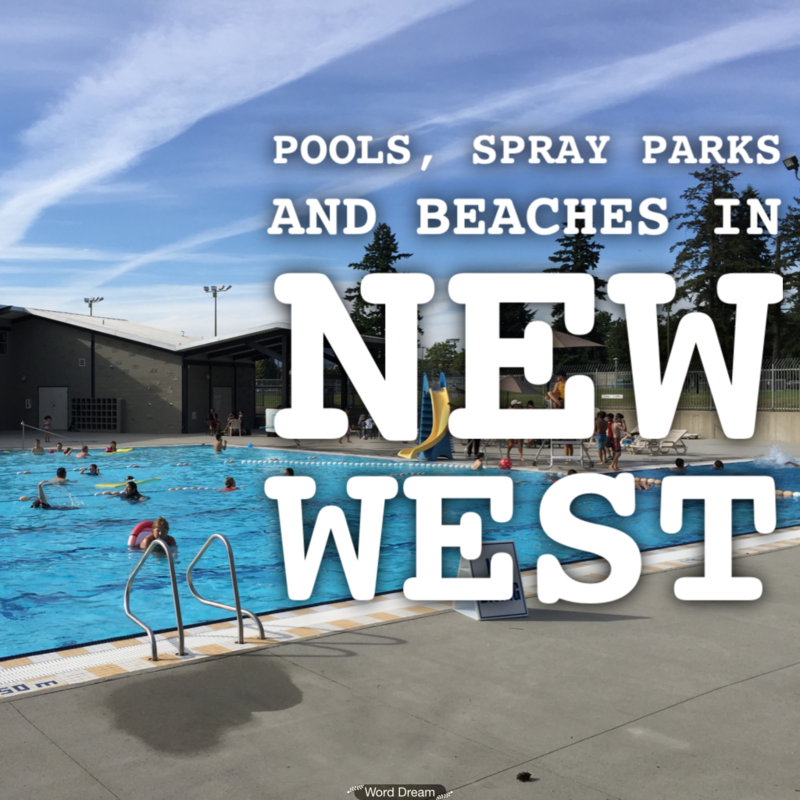 I do think there are a few kinks that need to be worked out, and some of them will likely be worked out in the “phase 2” expansion or in the coming weeks as people use the park and provide feedback to the Parks, Culture, and Recreation department. My biggest beef is probably the one I have heard the most – the access isn’t as good as it could be. There is really only one entrance in and out of the park, and it is at the far end of a privately owned pay parking lot with tonnes of giant puddles and poorly marked spaces. For me the park features mitigate the poor access, though, and it’s not enough to keep me away. 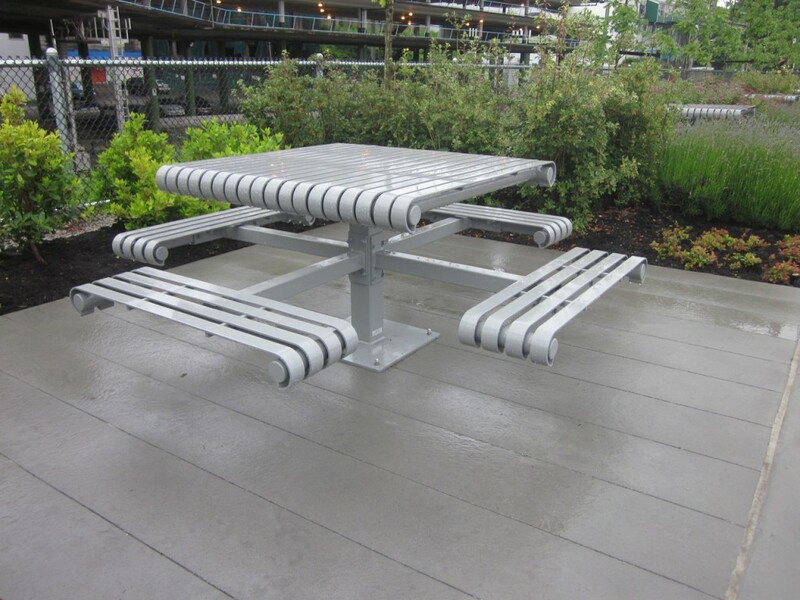 As well, an accessible pedestrian overpass is coming by the end of 2013 that will connect Fourth Street to the park. I don’t much care for turning around and looking at a giant, dark, looming parkade. I’m in the “tear it down” camp when it comes to the parkade, so perhaps I’m biased. I think it ruins what could be a fantastic urban view of some of the historic buildings along Columbia and might give some of the property owners an impetus to come out from behind the shadows and take ownership on how the buildings look. I also completely missed the basketball court (the photo below is Briana’s) and when I realized my error, I wished there was a “you are here” type of map at the entrance to help with wayfinding. I can imagine meeting friends from other communities who have never been to the park before and it being tricky to explain where to go. I cannot wait to spend a sunny summer day at this park (or simply a dry day, for that matter! ), and to enjoy a picnic and the park features with my family. So many people worked on this park, and they should be commended for what they’ve done. 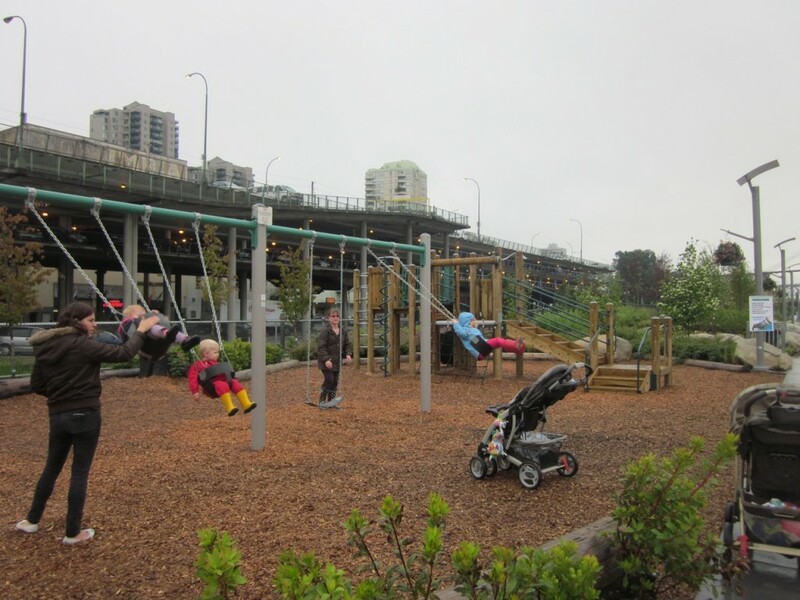 This park far exceeded my expectations about what it would offer the people of New Westminster and today reaffirmed that I am so proud to call this city home. Briana posted a number of other photos on our Facebook page. Tell us what you think of the new park!